In the weeks before Nolan was born, I became interested in cooking meals that I could freeze, never mind the fact that we have very little spare freezer space. 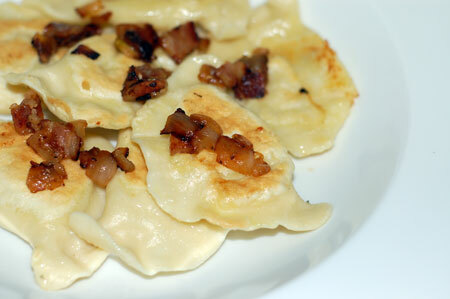 I made a huge pot roast and froze half of it, some ragu which I will write about next, and these pierogies. I made the dough for the pierogies the night before I planned to churn them out. It was pretty dry going into the refrigerator, but the overnight rest produced a dough that was pretty nearly too soft and sticky to work with. I used my pasta roller with the intention of speeding up the process, but ended up having to work in very small batches with large amounts of dusting flour and pass every chunk of dough through the rollers many times to get smooth sheets. Eventually I would end up with a soft, smooth sheet of dough just right for stamping out with a biscuit cutter and folding around dollops of potato-cheddar filling. Like any stuffed pasta or dumpling, this is one of those recipes that benefits greatly from assembly-line preparation, especially if you double the recipe as I did. Fortunately, Jeremy was hungry so he was easy to recruit. 🙂 He rolled and cut the dough while I doled out filling with my smallest cookie-scoop and sealed up each dumpling. Lots of work, but certainly worth the effort! We’ve benefitted since then, too, since the frozen pierogies cooked up just as I hoped they would. 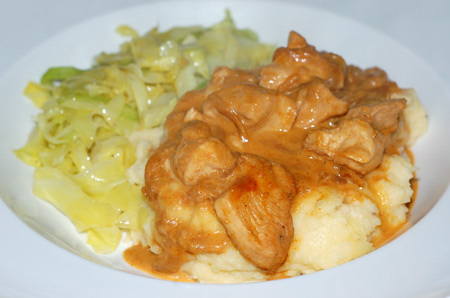 All those pierogies got me in a Hungarian state of mind, so a few nights later, I took a page from the quick-and-easy dinner category and made chicken paprikash (I know “paprikás” is the more authentic spelling, but I don’t flatter myself that my version was remotely authentic!). I based my version on this one from Simply Recipes, but I adapted it into a skillet meal with cubed boneless chicken breast to save time. Essentially, I caramelized the onion in some butter and olive oil, adding garlic and then sweet paprika from Penzey’s when they were beginning to look golden brown. I tossed in the chicken and browned up the outsides a bit, then added a partial box of leftover chicken stock—maybe a cup and a half?—and let it all simmer down until the chicken was done cooking and the broth had mostly evaporated. A big dollop of good sour cream stirred through everything, and it was done. I wanted to use up the extra potato-cheese filling from the pierogies, so I supplemented that with a few freshly boiled potatoes and a splash of milk to make cheesy mashed potatoes. I prefer spaetzle with my paprikash, but it helped clear out the fridge.